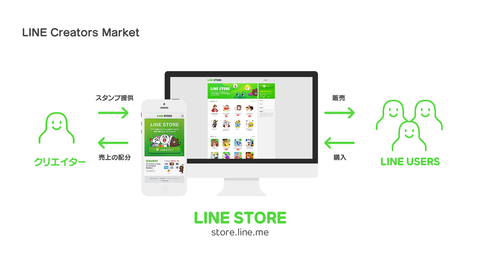 The “LINE Creators Market”, regardless of occupation, age, professional, amateur, and personal and corporate, it is possible that the “LINE Web Store” on sale to the stamp that you have produced anyone if LINE user It is a new platform. And stamp of the original character-famous character of LINE, until now, we have used only Sponsored stamp by companies, but beyond the frame, everyone is a stamp towards of 370 million LINE users. Registration and application to the “LINE Creators Market” is free. It is possible, after a review by the LINE, sold in packages of one set 100 yen stamp of 40 kinds and 50% of sales will be allocated to the author. We will start review, acceptance and sales in April or later.